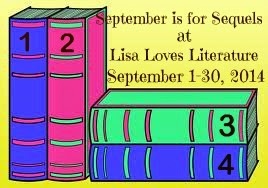 I'm participating this month in the September is for Sequels reading challenge. You can see my post and the million of sequels I need to read here. In preparation for this I requested a bunch of sequels from my local library. I have a bunch of sequels I own too, but I would like to at least get through those from the library first. I also have three days left of the Tackle Your TBR Read-a-thon I'm hosting and I'd like to get one or two more sequels in with that besides the one review book I'm reading. What sequel should I read first? Let me know what you think. I'll pick one and you guys can pick one and then I'll try to read them both before Saturday ends or in the coming weeks depending on the results. :) Lot's of goodies to choose from, that's for sure! Sweet Reckoning was a cute book w/ a little fighting, romance, heartbreak, and awesome character development. I could really connect w/ the characters. I enjoyed. Its been a minute but I still remember the impression the book left on me. I'd wait on the read on Isla. . . though entertaining! You may enjoy it! I'm curious about Star Cursed & Deception, too. Random question here, but your local library allows more than 2 books for checkout? Sweet Reckoning would be a quick read. Isla is a little longer. What can I fit in for tonight??? Yes, my libraray actually allows 35 items to be checked out, if I remember right from when we did the kids' summer reading program (we passed that number a few times this summer even with two library cards because of four kids and me and the librarian had to override the limit for us). Now if I'm checking out online for electronic audiobooks or ebooks, there is a much lower limit. May I ask where you live where they make the limit so low? Tonight. . . I don't know. Sorry, I can't remember. I read the book back in May. I believe Sweet Reckoning is a pretty quick read. I've gotten it mixed up w/ the school library, sorry (again). The limit is 50. I didn't even know this...I live in Georgia. The library's nearby are going through hard times, but the school library has a large selection but are very strict. I don't like it when library's struggle. They're such important parts of the community. I guess it's not completely surprising with all the electronic gizmos and then ebooks. I started Champion last night and am hoping to have it finished today and then I'll see where the votes are at and maybe grab Isla. There are so many good series out there! And we both know that a final book in the series can totally mess things up! Thanks, Pam! I think that you should read Pittacus Lore's book! I read the most recent one and, like usual, enjoyed it! Thanks for sharing! I've liked the others I've read and am planning on reading the newest one too.